This post was originally posted on July 11th. The album’s title track kicks everything off with the country charm that can only be expected when looking at the cover art. Short and sweet, with an empowering/encouraging energy, Katie Garibaldi’s honey sweet vocals are refreshing. “Make Them Go Away” later follows with a similar country-songwriter vibe, keeping the album consistent and enjoyable. “Holding On” plays with a more melodic tone that is entrancing. The track showcases Garibaldi’s vocal diversity beautifully, as well as her stunning songwriting ability, which seems to become exceedingly stronger as the album continues, even displaying different facets of the country singer’s personality. “Whispers & Rumors” proves to have more of an edge and attitude that destroys any possibility of monotony. Most notably, “Lock The Door, Lose The Key” not only features wonderful guitar, but a more provocative edge lyrically. In a culture of songs that aren’t exactly subtle when discussing more…ahem…intimate moments, Garibaldi hits like a crisp autumn wind, bringing back the graceful subtlety of artists before her, from Sinatra to Parton. “Close, Close, Close” sets up a streak of spectacular tracks. The strings on this track are beautiful, adding another dimension entirely to the song. In a more emotionally vulnerable style, Garibaldi hits listeners where it hurts with the insecurities that typically exist in a relationship. It is a very human song (see also: “Vegas” and “Wedding Day Song”). As for “Wedding Day Song,” there are endless possibilities to the soundtrack this lush, heartfelt song could be utilized, from bridal ads to wedding videos. “Always Kiss Me Goodnight” has a sanguine, sweet sound to it that lends itself to the country love song, making it easier to listen to time and time again. “White Roses” also has a similar smooth tone, following this time with a more melancholy feeling to it. Dealing with love and loss adds to how relatable each track is, giving a timeless sense to the album. There is a versatility to Follow Your Heart that separates it from other country albums, especially when you factor in the raw sound. Garibaldi maintains a certain power at a higher pitch, testing out different runs that certainly make an impact, and gives the album a quality that is impossible to ignore. 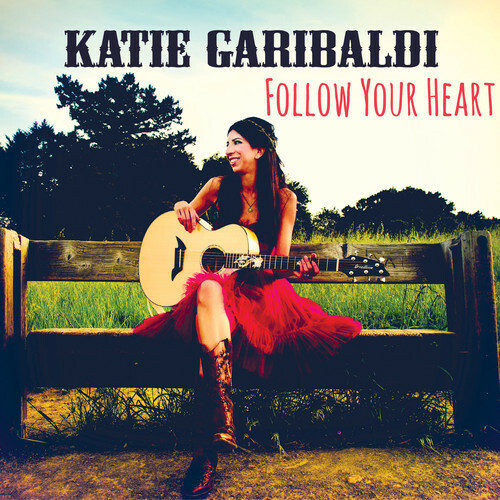 There is a raw, enchanting Americana tone that runs deep and would be impossible to fake, further giving Katie Garibaldi the mark of a genuine artist. For more on Katie Garibaldi, please click HERE.